I shot this at f/1.8 which regular readers know is something I generally avoid, but since I knew I wouldn’t be able to get super duper close to the squirrel I wanted to make the most out of whatever I had and try to get a shallow depth of field if at all possible. 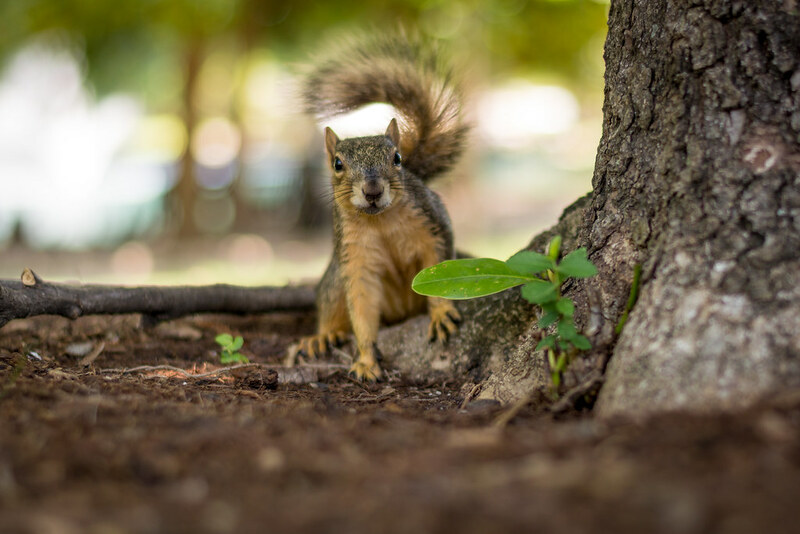 Even though the resulting image isn’t as zoom-in-to-a-hundred-percent tack-sharp as I would like, using the wide aperture gave me the bokelicious background I was going for and helped focus the viewer right on the eyes and face of the squirrel. It is ironic to me that you say this shot was so easy to take. I teach a Photo 1 class at night at a local Career College. My students would be ecstatic to catch such a great image. As I read your commentary, I know exactly what you are talking about in regards to crop sensors and depth of field. These are new terms to the 10 new photographers I met Monday night. In fact, I stopped myself from bring up sensor size because everyone in the class is on a crop. This week I am taking a new interest in my cameras, as I compose my presentation. But, I am re-discovering my love of a good simple image. The bokeh in both the foreground and background of your image are wonderful. The focus on his face is perfect. These are simple things to you and I, something we shouldn’t overlook. I thank you for teaching and inspiring. Oh Simon, I would be so nervous to have you in class. I’m sure you could teach it. I am in no way a professional. I have learned a lot since I took the same class about 4 years ago. I am happy to share. We actually a photo walk in the daylight somewhere in Cincinnati. Last year we went to spring Grove Cemetery. While next to one of the lakes a male swan decided we were too close to his nest. He charged at us wings and water flying. A couple of the students were in shutter priority and turned and caught some unbelievable images. Unfortunately I was looking at the back of someone else’s camera and missed the whole thing. No worries Rebecca! I’m no professional either, I promise :) Sounds like you had kind of a crazy run-in with those swans too. Good thing your students were prepared with their cameras! This is such a sweet little picture, lovely framing, expression, bokeh etc… Just because he was only a short stroll away doesn’t make it any less of a good photo. Thousands of people see these critters everyday in their neighbourhoods or parks, but not everyone takes time to SEE them and capture their portrait. I for one love these pictures of the creatures and things that surround us in everyday life. I look forward to your posts each week. Thanks for the inspiration to take my ‘big girl’ camera out with me more often. Thank you for your kind words Sabine! I know I’m also guilty of not taking the time to really SEE the world around me. Sometimes I’m so busy looking for just one perfect picture that I overlook all the wonders of nature right in front of me! And I’m glad this blog has been an inspiration to you, and has helped you get out more with your “big girl” camera! Keep up the good work! Well done! A really nice job with the squirrel. Combined with last week, are we now in ‘phauna (sic) phase’ of your blog?!?! Sorry, couldn’t help myself! Thank you for the reminder to look around and enjoy the glory of His creation. Knowing your affinity for squirrel pics, I thought you might enjoy this one Marybeth ;) Glad you like it! Simple things like Squirrel picture by you are more inspirational since they are achievable by most of amateurs without the most expensive equipment or having to travel at far away places. All one needs is curiosity to see and capture the the amazing photo opportunity provided by nature in every corner. Great work Simon. Always admire your honest and humble approach to photography. Thanks for visiting the blog and taking the time to leave a comment!